Clamping down of benefit cheats, those who fraudulently claim government benefits, has been a oft-repeated mantra of the political right in Britain. By ‘right’, I include the neoliberal New Labour project. Much of the mainstream media, not just the usual hard-right press, have merrily chimed in without needing too much encouragement. The usual news item focuses on some benefit claimant who is holidaying on a luxury yacht, or some other eye-catching headline. This follows the usual methodology of the populist right, use an individual story, even hearsay, to illustrate your point. There have been various government strategies to encourage us to ‘shop the scroungers’, and now the ConDem government will be entrusting the credit-rating agency Experian with tracking down benefit cheats — all performance and profit led. 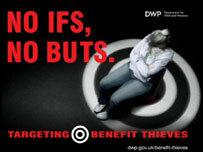 However, David Osler has posted on the statistics show that benefit fraud amounts to less than 1% of all benefit payments. So, the greater fraud is that perpetrated by politicians and journalists who have vastly exaggerated the problem. In absolute terms, that 1% translates into £1 billion, but even then, as Dave points out, the bank bailout was £850 billion. Categories: socialism, society | Tags: Andrew Windsor, bank bailout, bankers, banks, benefit, benefits, bonuses, CAB, cheat, cheats, Citizens' Advice Bureau, claimant, ConDem, council tax, credits, cuts, David Osler, expenses, Experian, fraud, housing benefit, housing benefits, media, millionaires, New Labour, pension, right, tax credits, tax evasion | Permalink.